Are you ready to get your driver’s license fast? Get your driver’s education anytime, anywhere with Aceable. 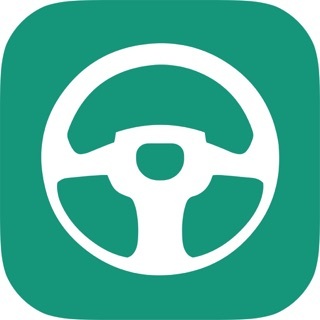 The Aceable Drivers Ed App completely replaces the traditional in-classroom part of driver’s education. 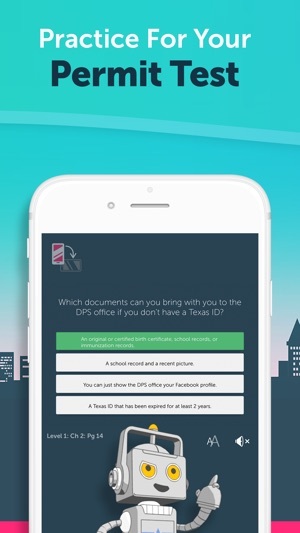 Take interactive drivers ed courses and practice for your learners permit written test right from your phone. 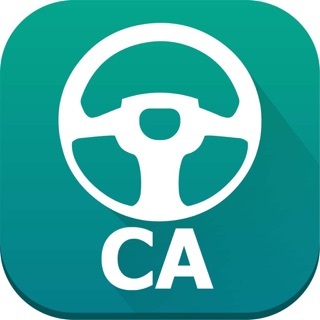 This is the ONLY native app that lets you take Drivers Ed! Say goodbye to long, boring lectures and say hello to entertaining memes & video lessons. Aceable has helped over 450,000 students get their drivers permit and license. 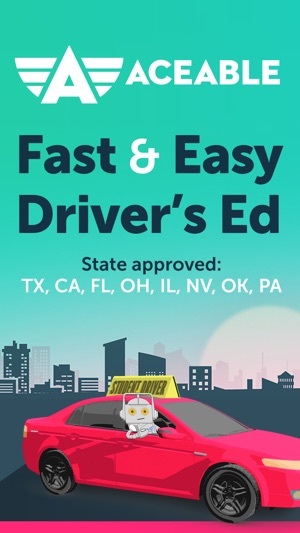 The app is fully approved by the governments of Texas, Florida, California, Ohio, Illinois, Nevada, Oklahoma and Pennsylvania and is 100% state-legal, so every lesson is legit. We make it simple to get your DMV learners permit and drivers license. Our simple instructions walk you through every step of the process while engaging content keeps you focused and actually learning. Install Aceable now and take the first step towards your drivers license! + Some apps are just study guides – but Aceable is a full state-legal replacement for in-classroom Drivers Ed. + Meet all the educational requirements for your permit and driver license. + Interactive lessons with videos, animations and memes. + We provide unlimited study tests and practice questions to help you pass. + Aceable never charges extra for tests or content! + A lot of courses say they’re entertaining, but Aceable takes it to another level. + Witty writing, relevant memes and interactive videos keep even those with shortest attention spans engaged and learning. + Don’t believe us? Just look at the reviews. + Aceable Drivers Ed is the absolute least-expensive way to get your driver’s license. + Up to 80% more affordable than traditional Drivers Ed. + Your progress syncs automatically across devices. + Our US-based customer support is available seven days a week to help with any part of the process. + Call, text or email! + Our user-friendly Parent Tools allow you to monitor your teen’s progress. + Understand the material covered at each level of the course. + Rest assured, your young driver is learning from the best! 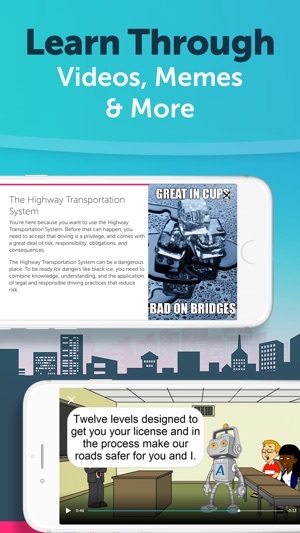 Make your Drivers Ed fun and convenient with Aceable – download now! 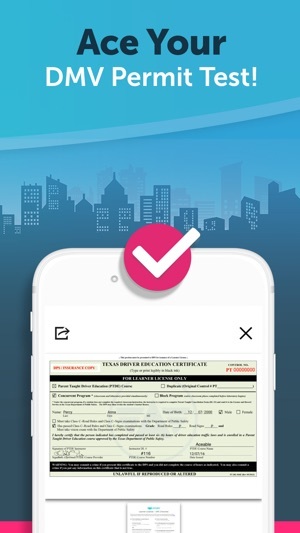 Aceable is approved by the Florida Department of Highway Safety, California DMV, Texas Department of Licensing and Regulation (TDLR), and the Texas DPS, Ohio BMV, Illinois Office of the Secretary of State, Nevada Department of Motor Vehicles, and then Pennsylvania Department of Education. In many states the DMV (Department of Motor Vehicles) may also be called DOL, DOT, MVDL, DPS, DVS, HSMV, Secretary of State, MVS, OMV, BMV, DDS and RMV. Drivers Ed may be called Drivers Education, TLSAE (Traffic Law & Substance Abuse Education Course), Florida Drug and Alcohol Training and Awareness (DATA), Driver Training, Driver Education, Student Driving, Texas Drivers Ed, California Drivers Ed or Driving Lessons. Fixed some issues with entering profile information. Do NOT expect to pass this test without reading the book. When I downloaded the app, I expected all of the important rules of the road to be covered in a way that would make me retain the information, but I was wrong. The app doesn’t prepare you for real questions on the permit test (or at least mine in California) and instead pounds concepts into your head that end up being useless on the actual exam. A lot of the information is repetitive and just a plain waste of time. And the practice tests lead you into a false sense of security. When I took the tests, for the most part I got 90s and even got a 100 on the practice test. The lowest score I ever got was an 85, which is still passing. Because of this, I walked into the test thinking I was definitely going to pass. I put a LOT of work into completing this work and never slacked off when it came to reading the slides and completing the practice tests, and it was all for nothing. Even a woman at the DMV told me that kids who use online resources instead of reading the books tend to fail the first time. If it is not practical for you to take real classes, I would recommend taking this course just to fulfill the 30 hours of instruction required by the DMV, but READ THE BOOK. The book will end up being much more beneficial than using Aceable. Hi there! I’m sorry you didn't feel the course prepared you for the permit exam. The material we include in the course comes directly from requirements set by the state, but we are always looking for ways to improve a student's experience. We would love to hear any specific suggestions you have about the course or practice tests. You can contact us by emailing our customer support at support@aceable.com. We're truly sorry for your negative experience and we look forward to hearing from you! Occasionally when I am on a slide reading/listening to the content, in the middle of the reading it will cut and automatically go to the next slide/question. It’s really annoying, especially when it’s a question and I haven’t even seen the full material yet. And I can’t go back to see what I missed. I know it’s not my fingers or anything else moving it because this has happened a ton of times and I am never touching the screen, not even close. The only explanation I can think of is that there’s something wrong with the app. I’m sorry to bother and be that person but I hate missing the material and it happens like every other slide, so I figured I should say something to someone who can do something about it. I think that it does that when the count down for when you can swipe ends. If that’s what’s supposed to happen, then this is about changing that, because I’m not always done reading. I imagine that this would also be an inconvenience for anyone else. It really seems like it’s a malfunction because it even cuts off your guy talking, way before he’s done. By the way, it cuts off during videos too. Right in the middle of them, sometimes in the beginning. Other than that, I think Aceable is a great app and I appreciate y’all for going out of your way to make it fun and helpful at the same time. I’m sorry that I have something negative to say about it. That’s the only real problem I have with it. I LOVE IT! It is so convenient and never crashed once on me. It teaches extremely well and I love how funny it is. I never thought that memes would be incorporated into my driving classes😂 At first I honestly thought all the corny memes and (some) bad dad jokes would be distracting but they would always make me laugh and keep me in a positive mood to keep learning. I’m pretty sure I even saw a few hidden dirty jokes in there😂 but I love it and my only complaint is a lot of the lessons just repeat the same thing over and over again or just point out things that are unbelievable common sense but I’m pretty sure thats just to make the lessons longer or to really pound the information into your head. Last thing to note is if you aren’t doing the app every single day for the maximum two hours than it will take months with this app to get your license.